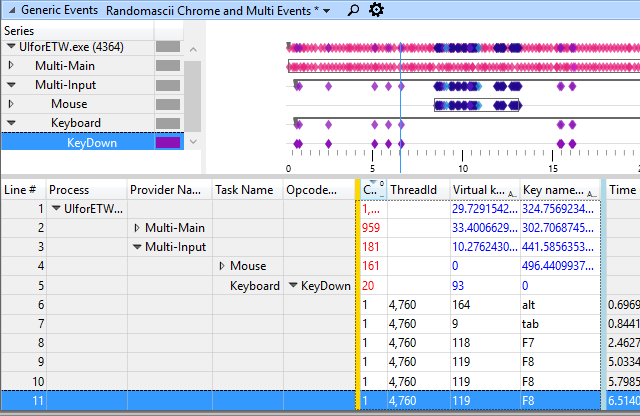 The Windows Performance Toolkit, also known as xperf, is a powerful (and free!) system-wide Windows profiler. In the past I’ve talked about using xperf to identify slowdowns in PowerPoint (tutorial version is here) by using xperf’s built-in sampling profiler, but that actually understates the true value of Xperf. While I think xperf is a better sampling profiler than most of the alternatives (higher frequency, lower overhead, kernel and user mode), xperf is really at its best when it reveals information that other profilers cannot measure at all. More details about this particular investigation can be found in the second ETW Training Video. Xperf has a high learning curve. Therefore I highly recommend that you start by reading some previous articles from this series. The best place to start is at ETW Central which has a well organized list of resources. The rest of this post assumes that you have installed UIforETW and familiarized yourself with some of the basics of WPA trace analysis. I’ve used all of these techniques. To help with the first option UIforETW has an input event logger which puts all keyboard and mouse input into the trace. If a hang is triggered by a particular key press or mouse click then finding its start point in the trace is trivial. Custom instrumentation (emitting ETW events at key points in your game, see the ETWEventDemo source) is also a common technique. Emitting an event every frame, or using CETWScope around slow operations, makes hitches plainly visible. However this doesn’t work when investigating performance problems in other people’s code, such as in Visual Studio. The Window in Focus graph tracks the programs you switch between and can given vital temporal clues. A specific event that indicates the time and duration of a hang would be ideal, and Windows 7 and above actually have such an event. The Microsoft-WindowsWin32k ETW user provider will emit an event whenever a thread resumes pumping messages after a significant delay. Windows Vista and earlier users are out of luck, but on Windows 7+ this is often exactly what is needed, and this provider is enabled by UIforETW. I’ve uploaded a .zip file of a sample trace (2015-09-25_20-56-25 VS F8 short hang.zip) to my github bigfiles repo. If you download this trace, unzip it to UIforETW’s trace directory (default is documents\etwtraces) then you can load the trace into WPA 10 by double-clicking it in UIforETW. Following along is by far the best way to learn wait analysis. You should also download the .txt file with the matching name and copy it to the etwtraces directory. UIforETW will display it when the trace is selected, and you can type your findings into the Trace information area. Once the trace is loaded be sure to Load Symbols from the Trace menu, unless you have Load symbols automatically after trace load configured. This trace records a hang where I was looking through VC++ build warnings by repeatedly pressing F8. The hang was about six seconds long and happened after the third time that I pressed F8. These sorts of details can be very helpful when investigating performance problems so I always try to record them in the Trace information area. With the trace loaded into WPA 10 you should see “Generic Events Randomascii Chrome and Multi Events” as the top graph and table. If not then you should use UIforETW’s Settings dialog to Copy startup profiles and then reload the trace. Having the right startup profile will make this process far easier. Since I mentioned that the hang was about six seconds long we already have a rough estimate of when it ends, but we can do better than that. 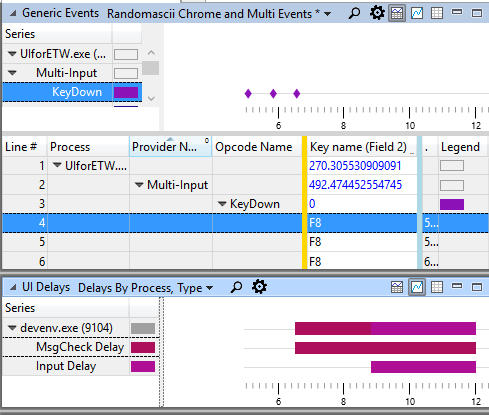 By opening the UI Delays graph from System Activity in the Graph Explorer we can get even better information. Whenever a UI thread stops pumping messages for more than 200 ms the Microsoft-Windows-Win32k provider records events and the UI Delays graph displays them. Here we can see that devenv.exe went for 5,469 ms without checking for messages, and for 3,172 ms of that time there was input in the queue that was being ignored. The table also shows us the process ID (9104) and the UI thread’s thread ID (10364). When investigating an idle-time hang it is crucial to know which process and thread to investigate so this information is vital. When analyzing an idle hang you should select the entire region of the hang, and it is particularly important to select the end of the hang. It is better to select a few extra tens or hundreds of milliseconds at the end rather than risk missing the crucial events that end the hang. This selection can be done by dragging with the mouse or by selecting the MsgCheck Delay bar in the UI Delays graph. Then just right-click on the selected region and select Zoom from the context menu. If a thread is not running, and it then starts running, then there was a context switch that started it (the new thread) running. That context switch is recorded in our ETW trace and contains all sorts of useful information. Include in this information is (for the traces recorded with UIforETW) the new process name and thread ID, the call stack which the thread woke up on (which is the same one it went to sleep on), the length of time it was not running and, for threads that were waiting on some synchronization primitive, the thread that woke it up. We know need to drill down into New Process devenv.exe (9104), New Thread Id 10,364. The CPU Usage column shows us that this thread only consumed 111.7 ms of CPU time over the 5.469 s time range shown, so we immediately know that this is an idle hang. Knowing when to do wait analysis (to find idle delays) and CPU Usage analysis (for busy delays) is crucial. Doing CPU Usage analysis when a thread is idle will lead to nonsense results. It is important to remember that there is nothing wrong with a thread being idle. Most thread’s should be idle. We are interested in this particular idleness because it is the UI thread and because it failed to pump messages for 5.469 s. This idleness is problematic because it caused a hang. The devenv UI thread did 47 context switches during this time period and we want to find the one that ended the longest period of idle time, so we need to sort the table by Time Since Last which, as I explained here, represents how long a thread had not been running when it was context-switched in again. The UIforETW startup profile configures two Time Since Last columns, one aggregated by Sum and the other by Max. Aggregating by sum is appropriate when you want to find a call stack whose context switches collectively account for the most time. Aggregating by max is appropriate when you want to find a single context switch that represents the longest idle time. In this case it doesn’t matter which one we use, but I recommend experimenting. If we drill down (select the first entry in the thread’s call stack and repeatedly press right-arrow) then we’ll find that there is a single context switch (see the Count column) that restarted the UI thread after it was idle for 5.341 s. That’s our hang, clear as day. It’s a single context switch (‘count’ is 1) that put the Visual Studio UI thread to sleep for 5.202 s. It doesn’t get much clearer than that. Farther down in the call stack we can see that ntoskrnl.exe calls FLTMGR.SYS which calls mup.sys!MupiCallUncProvider (and the eventual call to WaitForSingleObject). Ponder that for a bit. In our selected region their are context switch events for many threads in devenv.exe that spent most of the time range idle. So why aren’t we looking at them? It’s important to understand that Sum:Time Since Last just measures how long a thread was idle, and there is nothing wrong with a thread being idle. A thread being idle is only a problem if it is supposed to be doing something and isn’t. In fact, if devenv.exe has lots of threads then they had better be idle most of the time or else my four-core machine is going to be constantly busy. The reason we are looking at thread 10,364 is because (according to the MsgCheckDelay event) it is the UI thread and it went for 5.469 s without pumping messages. It kept me waiting, and that makes me angry. You wouldn’t like me when I’m angry. Since we know that the hang is related to file I/O we should look at what file I/O is happening during this time period. Luckily this information is also recorded by UIforETW. In the WPA Graph Explorer go to the Storage section and open up the File I/O graph and bring up a summary table. If you change the View Preset to Count by Process, Thread, Type and drill down into Process devenv.exe (9104), Thread 10,364 and look for an event with a long duration. If we sort by duration then we can just keep expanding with right-arrow. It doesn’t take long to find the event in question. We can see here that a Create file event, from devenv.exe, thread 10,364, took 5.342 s, trying to open \\Perforce\main, and that ultimately the network path was not found. The hang is because Visual Studio tried to open a non-existent network file, and sometimes that causes a 5.342 s network timeout. Hence the hang. The remainder of the hang is from a few other context switches and CPU time that account for the rest of the 5.469 s, but the one long bit of idle time is all that matters in this case. That doesn’t look like a file name. That looks more like the output from Perforce, only with back slashes instead of the forward slashes that Perforce uses. And that’s exactly what it is. At Valve (where I was working when I hit this problem) build results are stored in Perforce so we have pre-build steps to check these files out. The checkout commands print their results to the Visual Studio output window. Visual Studio ‘helpfully’ reverses the slashes and decides that this represents a file name on \\perforce\main. Since this whole thing started with me pressing F8 this means that Visual Studio was trying desperately to treat this potential file name as a source-file name associated with an error or warning message. sed -e s!//!! -e s!\.\.\.!—! I also reported the bug to the Visual Studio team. Having a trace is very powerful for this because it meant that I could tell them definitively what the problem was, and I could share the trace in order to let them confirm my findings. Just like minidump files are a powerful way to report crash bugs, xperf traces are a powerful way to report performance bugs. The bug was fixed in Visual Studio 2012 – UNC paths are now ignored by the output window’s parser. Mup.sys is the driver used for network file I/O. Therefore its presence on the New Thread Stack and the Ready Thread stack was a clue that a network delay was the problem. Doing file I/O on the UI thread is always a bit dodgy if you want to avoid hangs, and doing network file I/O is particularly problematic, so watching for mup.sys is a good idea. Some wait analysis investigations are more complicated than this one. In several investigations I have found that the main thread of a game was idle for a few hundred milliseconds waiting on a semaphore, critical section, or other synchronization object. In that case the readying thread is critical because that is the thread that released the synchronization object. Once I find out who was holding up the main thread I can move the analysis to that thread and apply either busy-thread analysis (CPU sampling) or idle thread analysis (finding what that thread was waiting on). Usually just one or two levels of hunting is needed to find the culprit, but I did recently trace back across six context switches in four different processes in order to track down an OS scheduling problem. For CPU activity this is dealt with by selecting the region of interest. For context switches this is dealt with by drilling down all the way and then looking at the SwitchInTime (s) column. This column records the time of the context switch. For another discussion of analyzing hangs with xperf see this wait analysis article by Trey Nash. This entry was posted in AltDevBlogADay, Investigative Reporting, Performance, Programming, xperf and tagged glitches, hangs, idle time, inputprocessdelay, summary tables, visual studio, wait analysis, xperf. Bookmark the permalink. Do you have any idea where Wait Analysis went in the new WPA 6.2 GUI? Yes, I do know where it went. Under Computation find CPU Usage (Precise) and that drag over to the analysis window. Then set the table to “Display graph and table” (right-hand corner of the table’s title bar) to make the summary table show up. Then use the View Editor to set up the columns correctly. You’re all set. Oh — one final step. Profiles->Save Startup Profile, so you only have to do this once. I’ll blog about this one of these days. WPA is better in most ways than xperfview. There are a couple of annoying bugs, but those should be fixed in the final release, and then I assume I will be able to recommend it with no misgivings. OK, it looks like this works. It looks like there’s a predefined column corresponding to the old sum column, but its label is indistinguishable from the max Waits column. Slightly unrelated, but on the topic of finding missing things: Do you know where the Disk I/O Detail graph? Specifically, xperfview graph has disk offset on the vertical access, along with some general descriptive information about the disks and partitions. The Disk I/O Detail graph is well hidden, but it is still around. Crack open the Storage section, then right-click on the Disk Usage section, and select Disk Offset Graph. I guess it’s traditional for that graph to be well hidden. It sounds like you have an equally good method but there is actually an event that does this in VS 2010. WPF has a frame present event documented in ‘\Windows\Microsoft.NET\Framework\v4.0.30319\WPF\wpf-etw.man’ event id 11061 – WClientUceNotifyPresent signifies when WPF presents a frame to the screen. Then it showed up in the list of providers given by “xperf -providers” as “Microsoft-Windows-WPF” so now I should be able to enable it, next time I need that. this turned out to be just what I needed. Steam recently occasionally hangs for a good minute or so. This is especially annoying since it also pauses any game trying to communicate with Steam. So being a software engineer I gave profiling a try. I had only briefly looked into xperf after reading about it here so the most time was spent trying to understand the program and experimenting. But in the end it was mostly a matter of looking at the maximum Time Since Last of various threads. The problem turned out to be a blocking call to WinHttpGetProxyForUrl in the steamclient.dll in one thread that takes 115 seconds. I don’t know why it takes so long*, I just know that about 30 seconds later a couple of other Steam threads start waiting for the blocked one, at which point the games stop reacting as well. Do you think that’s something that should be fixed in Steam? I suppose so, it may be a rare thing to happen (and I’m still curious why it does) but such a blocking call should probably not be done in a time critical thread anyway, right? In case you want to fix it, do you need the trace? It’s pretty heavy at 1.7GB and I suppose the function name should narrow it down by a lot so probably not. Thanks for the articles and have a nice day. * The MSDN has this to say: “The auto-detection process can be slow, possibly as long as several seconds.” That sounds more like “up to 10s or so” to me. It seems terribly appropriate that you would turn xperf against Steam. Isn’t it wonderful that it can be used to profile *any* program, whether you wrote it or not. Proxy resolution is a tricky problem, I remember that much from my days working on Internet Explorer, but I don’t remember much more than that. However I think that if proxy resolution takes that long it is hard to avoid hangs. Asynchronous programming is all well and good, but at some point somebody *needs* the answer. I’ll e-mail you and get some traces — we have a system for getting traces when needed, with Valve’s instrumentation and my preferred providers. Thanks for the trace. I confirmed your analysis. It’s annoying that WinHttpGetProxyForUrl sometimes takes so long to return, but we’ll fix the code to ensure it doesn’t cause hangs in games launched from Steam. Number 6 is ‘ReadyThreadStack’ not ‘ReadyingThreadStack’, right? Unfortunately the link to the other wait analysis article at windowsitpro doesn’t work for me. You are correct. “ReadyingThreadStack” would be more consistent with the other column names, but “ReadyThreadStack” is what it is actually called. I’ll update the article link — I think you found the right one, although I can’t be certain. You can’t use Microsoft-WindowsWin32k with xbootmgr, can you? I don’t know — I haven’t actually tried xbootmgr. Hey there Bruce, somebody did look closely at the data – smart choice; and thanks but I neither know someone living in Kirkland, nor do I drink. So buy one for yourself! You deserve it for keeping up the “dying art” of easter eggs. Educational article, thanks. Minor inconsistency: “My system has eight hardware threads (four hyperthreaded cores)” v. “or else my six-core machine is going to be constantly busy”. I have a four-core machine at home and a six-core machine at work and I lost track of which one I was talking about. Thanks. Fixed. Nice article. Could you also post one about finding the cause of deadlocks? In that case there is no readying thread, the app just hangs forever. Deadlocks are a pain. Your best bet there is to capture a crashdump, using procdump.exe from sysinternals, or task manager. It all looks nice when you explain this, but it looks like you need lots of inside knowledge. For example, how did you know that Microsoft-Windows-Win32k provider records “UI Delays” events and what they actually mean. I had a look through some providers and for me it looks like a full time job digging through all those events generated by for example, Generic Events section of System Activity tab. Maybe someday Microsoft will explain the rest. The good news is that UIforETW provides good defaults and my blog explains most of the key concepts, and those concepts then prepare you for some explorations beyond the norm. Thanks for the fast response, Bruce. I also think WPA/WPR are awesome tools, and I started to use them more and more, especially since Microsoft introduced mandatory performance tests. However, it happens many times that I get a little progress and then I get stuck and don’t know how to proceed. Is there a forum or site or discussion list where I can upload my Traces and I could get some pointers on what to do next?